There are 66 apartments on five floors although at the west end, furthest from the main road, the block steps rapidly down to a single storey to form a transition to the smaller scale of buildings in the next part of the street. 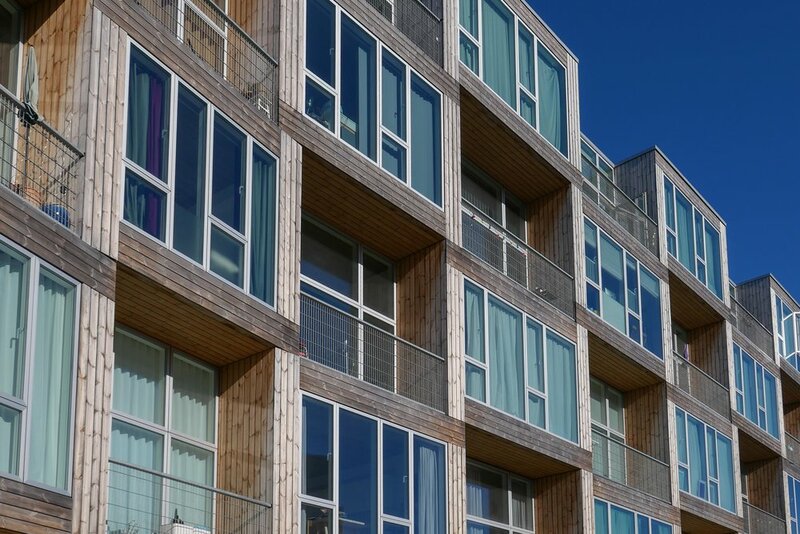 The design of the street frontage has a clear and neat articulation with wood on the façade creating the impression of a regular set of large wooden boxes stacked up corner to corner with the spaces between glazed but set back to form balconies. 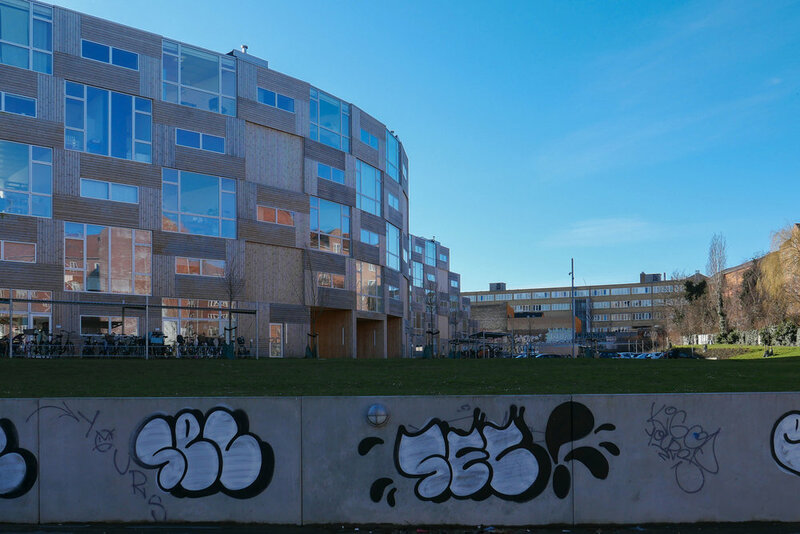 Unlike the 8-House in Ørestad - also by Ingels - this gives vertical and horizontal lines across the front a rational coherence … my main criticism of the earlier apartment building in Ørestad is that with the underlying arrangement of apartments along, in effect, a ramp that spirals up the building, then vertical and horizontal lines get chopped up and broken … it's not by a huge amount but enough to make the façade there look and feel restless or uneasy. At Dorotheavej, the back of the building has windows that look across a large open area of grass and services, including car parking and the square division of the front elevation is repeated but more simply expressed with very shallow stepping backwards and forwards of the elements making it look more like a checkerboard in shallow relief. That might sound like damning with feint praise but actually it makes the façade look honest and straightforward but still expresses the internal arrangement and internal divisions but avoids the grimly stark, cliff-like backs of most modern blocks. In too many buildings you find that money and thought has been spent on the front but both run out by the time you get to the back but here, at Dorotheavej, it is actually a pleasant and elegant elevation and the gentle curve, determined by the footprint, even more than on the front, reduces and softens the impact of what is a very large block. This complex curve also means an interesting dilemma or an interesting challenge for the inside. 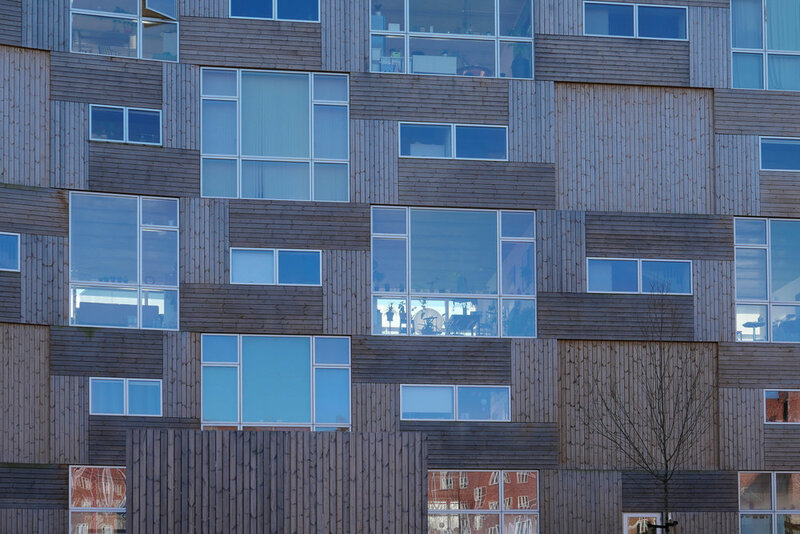 If the front looks like a set of regular boxes repeated along the building, the curves means that cross walls are set at angles and there is a huge variety of arrangements in the individual, wedge-shaped apartments. There was a prospectus on line - issued for potential tenants - and the choice of internal arrangements of the apartments was bewildering - so rather like the different plans within the VM Houses by Ingels and JDS from 2005. At Dortheavej there are generous ceiling heights and, as an interesting consequence of the staggered-box design, there is a difference of floor level between the main box and the recess on either side so there can be interesting steps within each apartment and several of the apartments have an internal staircase with bedrooms on a separate level. Sizes of apartment vary from 65 square metres through to 115 square metres with most having one or two bedrooms although there are studio apartments and some of the larger apartments have a small study that could be used as a third bedroom. A standard trick here is to use interlocking L- shapes for adjoining apartments reached from different staircases so both have a large room running across the full width and then one has a front-facing room and the other a back facing room with internal bathrooms in the area between. This interlocking of L shapes is found in the plans of apartment buildings in the city from the 1920s and 1930s and the large central archway is, of course, an echo of the archway through at Hostrups Have from 1936. That's not saying that Ingels here is being derivative … he is simply showing how well he knows and how well he understands the history and the conventions of housing in the city and is playing games with successful forms and styles for the building type to come up with clever and good variations on a theme. The building would certainly more than justify that Award if they do win. 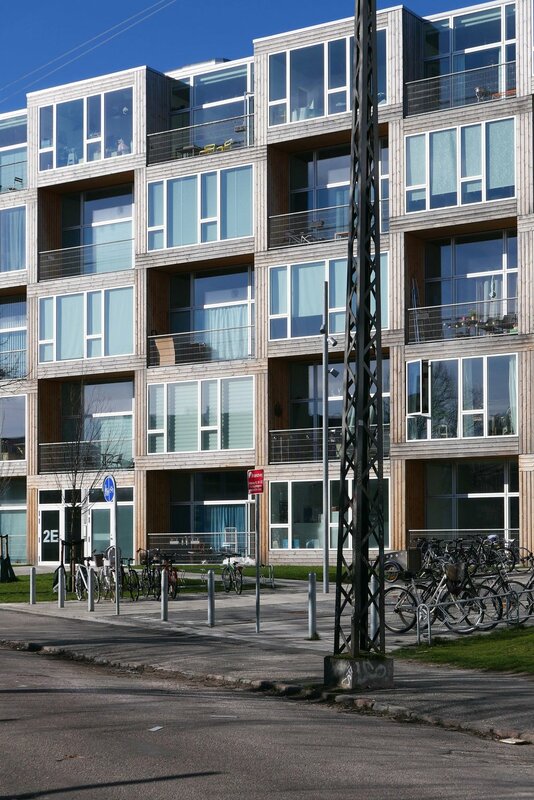 * this arrangement means that apartments run back the full depth of the block with windows to the front and to the back and there is no connection between one vertical set of apartments and the next except outside at street level. 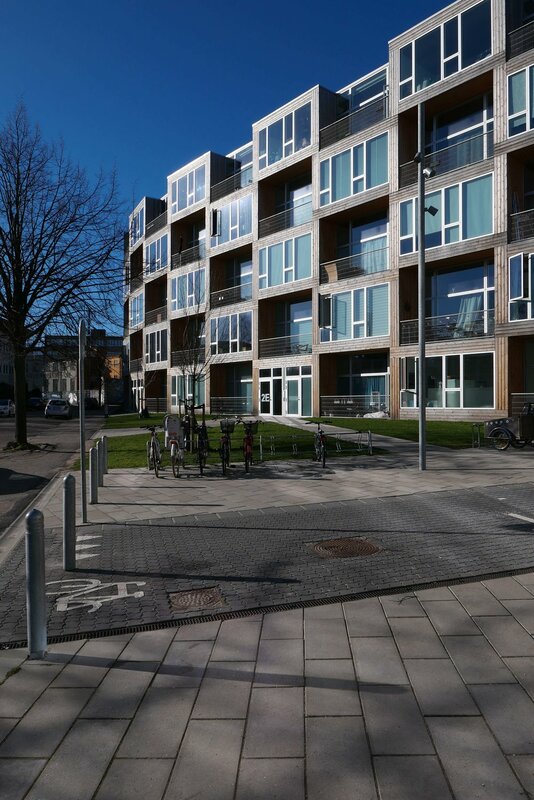 An alternative arrangement is to have a main entrance and then access from a central corridor or to have external galleries or long public balconies at each level with the front doors accessed from there but both alternatives usually mean a compromise with some apartments with windows on just one side of the building or, with gallery access, some compromise in privacy as people walk past to get to their own door.